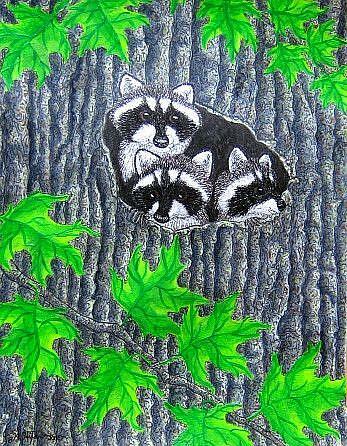 This is a mixed media drawing of raccoon babies that began as a demonstration piece at the Naturefest art show in the Cleveland Metroparks. 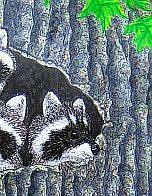 The hundreds of lines on the tree trunk don't show up in photos, but it took hours to do all the detailing with multiple color inks & watercolor. I was trying to show the cuteness & vivaciousness of these boisterous wild babies and am not sure that i've completely captured it.